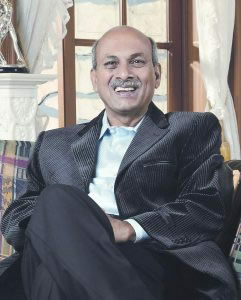 The first Chancellor of the KLE Academy Of Higher Education and Research Dr. Prabhakar B. Kore, who has been the chairman of KLES for the past 25 years , has a very versatile personality and his diverse interests have seen him taking up varied roles in the fields of politics, education, agriculture, co-operative endeavor and community building. Today under his able leadership KLE Society has 211 Institutions, in which 7000 dedicated & motivated faculty is serving and over 75,000 students have enrolled for various courses ranging from Kindergarten to Post-doctoral courses, in traditional, technical & medical educational institutions. The establishment of a 1200 bedded, free (charitable) teaching hospital in addition to the 1000 bedded state of the art super specialty hospital has been the mirror to reflect his great virtues of making KLE Society to be socially accountable and responsible. There cannot be any other better way of responding and honoring this great personality, other than naming the KLE Hospital as KLE Dr. Prabhakar Kore Hospital and Medical Research Centre. Apart from having nearly 2000 beds under one roof, (one of the biggest hospital in the country), the hospital has various satellite centers at the neighboring cities viz: Gokak, Jamkhandi, Gadhinglaj, Hubli and Ankola, which are linked to the parent hospital through the telemedicine, thereby facilitating and providing optimal patient care to the community located elsewhere in the periphery. A multi-faceted personality, his diverse interests have seen him take up varied roles. Ex-Chairman, & Director of Shri Doodhaganga Krishna Co-op.Sugar Factory, CHIKODI which received the award for being the Best Co.op. Sugar Factory in South India. Director, INDIAN Sugar and General Industry Export & Import Corporation Ltd., New Delhi. Director, Rajkumar Forge Ltd., Pune, Maharashtra. Chief Promoter of the Proposed Shivashakti Sugars Ltd. being setup at Soundatti, Tq: Raibag in Karnataka. Trustee on the Board of Society of Computer Technology & Research (PICT), Pune – Engineering Institute. President, Lord Basaveshwar Education Society, New Delhi. Vice-President, All India Private Medical Colleges & Private Engineering Colleges Association, Bangalore. Working President, Belgaum District Task Force on Total Quality Management in Higher Education. Member State Level Apex Body (SLAB) – Quality Assurance & Sustenance in Colleges and Universities in Karnataka – TQM & NAAC Accreditation. A Member of the All India Council for Technical Education, New Delhi. President, Reception Committee, All India Veerashaiva Mahasabha’s 21st Convention held at Belgaum. Chairman, 5th Akhil Bharat Sharana Sahitya Parishat held at Belgaum in 2003. Actively promoting the welfare of the farming community through education on growing of commercial crops, dairy farming, floriculture and poultry. Responsible for establishing District Level Mahila Co-op. Bank, Belgaum. Instrumental in establishing 8 additional branches of the Ankali Urban Co-op. Credit Society Ltd. Instrumental in the successful conduct of Karnataka State Special Legislature Session, a historical event, held at Belgaum from 25th to 30th September, 2006. Conferred Honorary Doctorate by Karnatak KLE Academy Of Higher Education and Research Dharwad, in its 58th Annual Convocation held on 13th February 2008 in recognition of his outstanding contribution to the field of education. Recipient of the Life Time Achievement Award for Education, Service and Commitment to Society awarded for the very first time by Veershaiva Samaj of North America in New York. Recipient of ‘Suvarna Karnataka Rajyotsav Award – 2006’ for outstanding contribution in the field of education by the Govt. of Karnataka. Recipient of the ‘Outstanding Educationist’ of the year 2004 by ‘Giants International Group’. This prestigious award was presented by Sri Amitab Bachhan, the icon of the Indian Film Industry. Recipient of Rotary International Award for his outstanding contribution in the field of Education and Health Services. Recipient of Karnataka Sangha, Pune Award. Recipient of prestigious Aravind Award by Nadoj Pratisthan, Belgaum. Actively involved in the Karnataka Rang Bhoomi and Natak Academy. Honoured on 21st December, 2007 by the Kannada Sangh Bahrain, the, Island of Pearls in Persian Gulf, in “Kannada Vaibhav 2007” at the hands of Shri Balakrishna Shetty, Indian Ambassador to Bahrain.